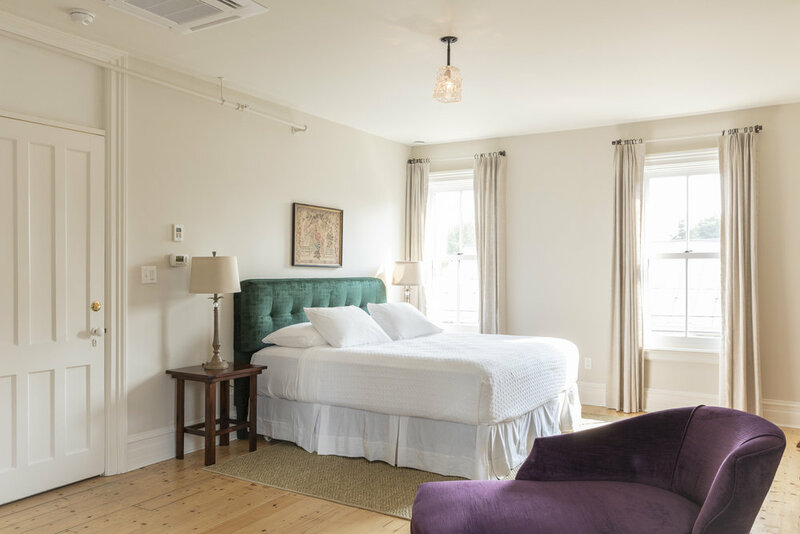 Elegant comfort awaits you in the Hudson Valley at our recently renovated boutique hotel, offering nine spacious and well-appointed guest rooms. Each room features luxurious bedding, robes and slippers, ensuite bathrooms with towel warmers, antique furniture and custom velvet headboards. Most rooms include stunning full or partial Hudson River views. Choose one of our two suites for added luxury featuring grand sitting rooms with soaking tubs. All rooms include continental breakfast of fresh fruit, yogurt, house-made granola, seasonal bread, coffee, tea and spring water. Each room also includes 2 cocktails or wine of your choice in our Tavern which is currently open Thursday to Sunday. Large sunny room with three large river view windows, a queen bed, antique dresser and sitting area with settee and armchair. 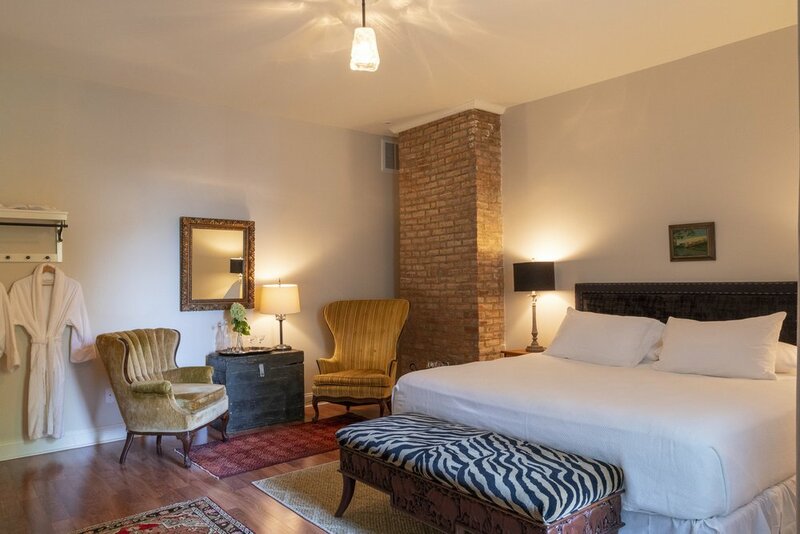 This romantic room with two large windows overlooking the village features a queen bed and an antique armoire. A grand guest room that has two queen beds and living area. The two large windows look directly to the Hudson River and the famous Stewart House willow trees. This bright room features a magficient view of the Hudson River and our beautiful willows at The River, a king bed and sitting area. Quiet oversized room with king bed and sitting area. This large romantic suite boasts a living room with large soaking tub with a view of the Hudson and a separate bedroom with king size bed. A good option for a family with a village facing view, featuring a king size bed and sitting area with a pull out couch. This luxurious third floor suite offers a large living area with soaking tub and antique wet bar, king sized bed and spectacular view of the Hudson River. A great family option, this quiet third floor room facing the village of Athens, features a king size bed and sleeping nook with twin bed.